No live organism can continue for long to exist sanely under conditions of absolute reality; even larks and katydids are supposed, by some, to dream. Hill House, not sane, stood by itself against its hills, holding darkness within; it had stood so for eighty years and might stand for eighty more. Within, walls continued upright, bricks met neatly, floors were firm, and doors wre sensibly shut; silence lay steadily against the wood and stone of Hill House, and whatever walked there, walked alone. In Shirley Jackson’s classic horror novel The Haunting of Hill House, four individuals meet to discover the secrets of a haunted house. When they first come to the house, there is an aura of optimism, but as the stay continues, macabre events begin to unfold and fear begins to grip the denizens of Hill House. 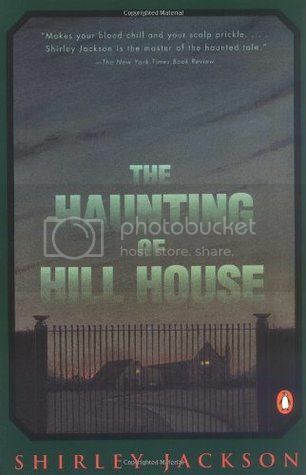 This post is part of a readalong of “The Haunting of Hill House” by Shirley Jackson. The readalong is being hosted by The Estella Society. Rather than following along with the questions or doing a traditional review, I’m posting my reflections on the book, which will contain mild spoilers. The book opens as a bit of a character study. There’s the doctor, who is responsible for inviting guests to the house. There’s Luke, who represents the family. Theodora is a bohemian woman who lives a life that’s unconventional by 1959 standards, and is potentially a lesbian–she admits to living with someone without being married, and there’s a telltale evasion of gendered pronouns. And then there’s Eleanor, through whose voice the story is told. I view Eleanor’s character sympathetically. She’s spent the last decade or so caring for her aging mother, and now that her mother’s dead, she feels liberated. I theorize that even from the beginning of the book, she’s going through some kind of mental break. She drops everything, steals her sister’s car, and walks away from her old life, which seems desolate and hopeless. Before judging Eleanor too harshly, we have to remember that the book is set before it was common for women to have jobs or to remain unmarried by choice. Because Eleanor spent her youth caring for her mother, she sacrificed her future. She’s too old to marry and has no marketable skills, but she’s young enough that she doesn’t want to give up on herself just yet. She sees the journey to Hill House as a kind of homecoming to a future of her choice, and doesn’t seem to get that her stay there was always meant to be temporary. And as time passes, the atmosphere of Hill House gets to her. Although the book is ambiguous, I don’t know that there ever were any ghosts. The messages from the house always targeted Eleanor, but as the book progresses, we can tell from Eleanor’s inner voice that she’s growing increasingly unstable. She’s coming on to Luke even though he’s shown no interest, and he starts to think of her as more of a child. She’s alternately clinging to and despising Theodora. And then there’s a point where she seems to entirely take leave of her body and becomes one with the ghosts. I theorize that the ghosts are Eleanor’s own inner demons, and that their message speaks of Eleanor’s own feeling of lacking a place in the world. She’s nervous about her place in the group, she’s nervous that she’s got nothing to call her own, and Hill House gives her the chance to be the center of attention for a change, even if it means destroying herself in the process. Let’s move on Mrs. Dudley, shall we? Eleanor is cool and all, but Mrs. Dudley is clearly the star of the show. She’s just a rosy bubble of delight. I kid, I kid. She’s creepy as hell, and easily my favorite character of the book. I love how she seems like a broken record, caught in the routines of Hill House but unwilling to deviate in the slightest, and very adamant about it. Her warning that if they stayed the night no one would hear them scream made me smile, as weird as that may sound. And she’s very particular about where the china goes and the fact that doors are supposed to be closed. I think Mrs. Dudley takes a sadistic delight in adding to the atmosphere of Hill House and making it that much more fearsome. The Haunting of Hill House is much different than the sci-fi/fantasy/historical fiction novels that I normally read. It felt good to step outside of my comfort zone and to read something that combines my love of unreliable narrators with an atmosphere that’s truly eerie. Shirley Jackson did a fantastic job of contrasting a mood of optimism and childish joy with the complete evaporation of hope within Hill House’s walls. This was such a great book to read; even though it was very creepy at times it was also witty and had it’s funny moments. Some of them even remind me of Clue, the movie. I will post my review later on the day, hopefully! Yes! I was thinking the same thing while reading. All we need is Tim Curry to make it complete! Great post and excellent discussion of Eleanor’s character. I know I’ll be rereading Hill House in the not too distant future… it wasn’t the terror-inducing book I was expecting, but I was very impressed with the way Jackson was able to slowly build the tension and dread. Thanks! It wasn’t as scary as I expected, but I loved the psychological aspect of the story and even the fact that nothing really happened until about halfway through. Like you, I found Eleanor’s character fascinating and was definitely sympathetic. She was just so sad and lonely. I think it’s the expectations of the times but also her inability to reach out to others and build a life for herself (in contrast to Theodora). I need to read again but I felt like the haunting was real, though some of it certainly in Eleanor’s head. Theo was super interesting because she was the opposite extreme as Theodora. She’s confident and accepting of who she is even though she still seems like an outsider, whereas Eleanor tries too hard to find a place for herself and overcompensates.